Brazilian beauty artists were very on point this season. 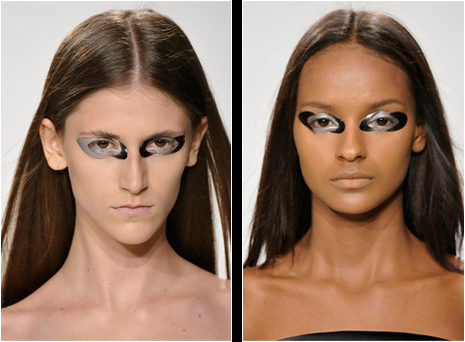 Other than the marabou feathers at Fabia Bercsek, my favorite take on make-up were the metal plates around the eyes of the models at the Pedro Lourenço show on Sunday morning. Personally I think they look hideous. Fashion is wonderful. There is something for everyone. I forgot to say Thank you for your posts! Whether I like what I see or not is immaterial. I so appreciate the opportunity you provide me to be exposed to some always interesting looks!